Saint Marina, also known as Margaret, was martyred at the beginning of the fourth century. Marina is traditionally depicted with the dragon, the devil in disguise, which she killed. 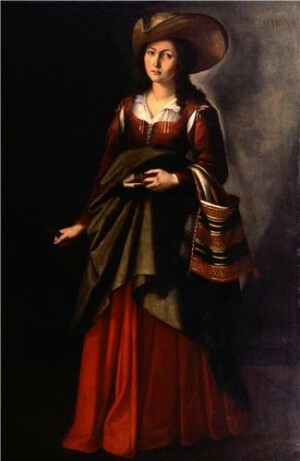 This is a much simpler representation, in her role as shepherdess, with a crook and saddlebag (alforjas). Most of Zurbaran’s female saints were commissioned as parts of large series. They were very popular and were repeated both by the artist and by his workshop in Seville. This example is solely the work of his assistants.